Author Robert Boynton presents his book about North Korea's abduction program at the Korea Economic Institute of America. The story was almost too bizarre to believe – foreign, evil frogmen emerging from an inky sea, snatching young couples from beaches and transporting them by boat to Pyongyang, where they were held prisoner for decades. 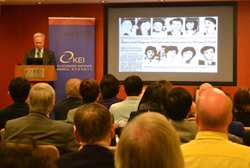 On February 3, 2016, the Korea Economic Institute of America was proud to host Robert Boynton, director of New York University’s Literary Reportage Concentration and author of the new book “The Invitation-Only Zone: The True Story of North Korea’s Abduction Project.” Joining Boynton were Kathy Moon, SK-Korea Foundation Chair in Korea Studies at the Brookings Institution, and Sheila Smith, Senior Fellow for Japan Studies at the Council on Foreign Relations. Boynton introduced his book and the abduction issue, and then he sat down with Moon and Smith for a discussion of the larger implications of this project. In the decades following the Korean War, North Korea initiated a top-secret project to kidnap ordinary people from Japan, reeducate them, and turn them into international spies for the regime. In the late 1970s, dozens of Japanese disappeared without a trace from beaches, schools and sidewalks. It wasn’t until 2002 that Kim Jong-il admitted they had taken thirteen people – and allowed five of them to return to Japan to visit their families. Boynton became interested in this story in 2002 after seeing a photo of those five abductees in "boxy, 1950s-era suits" descending from a plane to meet their families again for the first time in decades. In the following years, Boynton spent time in Japan and South Korea conducting research about this abduction program and interviewing the abductees themselves about their ordeal and their lives in North Korea. “The story was almost too bizarre to believe – foreign, evil frogmen emerging from an inky sea, snatching young couples from beaches and transporting them by boat to Pyongyang, where they were held prisoner for decades.” The more he dug into the project, he said, "I discovered the story was stranger than I had imagined." As fascinating as the story of these abductees is, both discussants pointed out that this story is not just about the people who were taken, but paints a larger story about the relations between North Korea and the outside world. Kathy Moon described the project as a sort of "brain-pour" - a reversal of brain drain. Kidnapping certain people from around the world, she said, was a way for North Korea to fill in gaps in talent and knowledge. She also noted that the abduction project is not an isolated phenomenon – it is closely linked to North-South relations, Japan-North Korean relations, and even treatment of ethnic Koreans within Japan in the decades following WWII. "The beauty of your book is, I expected it to be just about abductees, but I learned so much more about the histories of that time in all of these societies - in Japan, in North Korea and in South Korea." Sheila Smith emphasized the importance of the abductee issue for Japanese society. For years, the Japanese public had dismissed rumors of abductions as crazy tales or conspiracy theories. But when the five abductees returned to Japanese soil in 2002, she said, "There was a waking up of Japanese popular consciousness about the behavior of the North Koreans and about the threat they posed to Japanese security…it brought it home in a much more internalized way." Please direct any inquiries to Jenna Gibson at jg(at)keia.org.